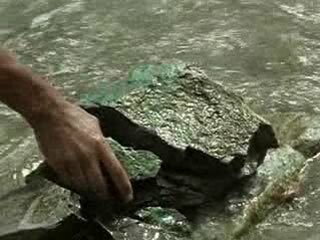 Video clip synopsis – Gregory Kopa, a Bougainville villager describes how he felt when geologists started to look for copper on Bougainville in the 1960s. Broadband MP4 mining_bb.mp4 (11.3MB), suitable for iPods and computer downloads. Mining Bougainville is an excerpt from the film My Valley is Changing (26 mins) produced in 1970. The building of a giant open-cut copper mine on the island of Bougainville brought profound change to local landowners. Despite royalties, training programs and extensive development, landowner concerns eventually escalated into conflict, which resulted in the closure of the mine. These issues are already clearly evident in this film, made shortly after the mine opened in 1970. The islands of Bougainville were part of German New Guinea from the 1880s until the end of World War I, when they became annexed to Australia’s New Guinea territories. Later, in 1975 at the time of decolonisation, they became part of independent Papua New Guinea. Bougainvilleans lived largely from subsistence gardening, hunting and fishing, in a matrilineal system where each person was identified by membership of their mother’s clan. Bougainvilleans felt separate from Papua New Guinea and saw themselves more aligned – physically, emotionally and culturally – with the Solomon Islands. Secessionist sentiments flourished and threatened the cohesion of the newly independent nation of Papua New Guinea. Missionaries had been very influential. In particular the Marists provided much of the education, and many current island leaders are former seminarians. Discovery of copper deposits in the 1960s led to the development by Conzinc Riotinto Australia (CRA) of the Panguna open cut mine – at that time the largest in the world. A CRA subsidiary, Bougainville Copper Limited (BCL) began building the infrastructure and facilities for the mine, which included a port, the town of Arawa, and a network of roads. The company registered various traditional landowners of the Nasioi language group, but excluded women despite their position as traditional custodians of the land under the matrilineal system. The Australian government hoped that mineral wealth would fund future development in Papua New Guinea, and negotiations led to the Bougainville Copper Agreement in 1967. In this video clip, Gregory Kopa, a resident of Moroni village, explains that the local people were fearful of the consequences of a mine and how he told the CRA mining company and the government (Papua New Guinea was then under Australian Administration) about their opposition to the mine, which was to be located on land traditionally owned by his people. In response, Gregory was told that the resources found on his land belonged not just to his people, but to everyone in Papua New Guinea. The mine started production in 1972 under management of Bougainville Copper Ltd with the Papua New Guinea government as a 20% shareholder. It ceased production in 1989. Imagine the government told you that your home must be demolished to create a mine. You will receive none of the profits made from this mine, but you are invited to work in it. You are told this mine will benefit your whole nation. ## What would you feel about the government? ## Would you feel possessive over your home? ## In what ways would this incident affect your sense of belonging? What ‘belongs to everybody in Papua New Guinea’? Do you think Kopa feels like he belongs to the Papua New Guinea community? Complete this quote: “It’s not just a block of dirt to them __________________________________________ to destroy it.” By mining the land for copper, whose possession was CRA violating? During Kopa’s voice-over of ‘they don’t hear me’, a CRA geologist is shown smirking and laughing. The director has deliberately placed the geologist’s reaction out of context. What feelings would be stirred in an audience when viewing this editing choice? This video clip begins with Gregory Kopa’s monologue. In what ways does this influence the audience’s response to the video clip? Compare the first two shots of the video clip with the first shot of the CRA geologist’s legs. How has the director created a sense of ‘them’ and ‘us’? To whom is Kopa referring when he uses ‘our’, ‘my’, ‘you’ and ‘they’? a sense of threat by an outsider. Compose a dialogue between Gregory Kopa and an Australian government official. Discuss the notion of to whom the land belongs, and what the appropriate ways of using that land might be. The Age Newspaper, ‘Bougainville Copper’s mine regains shine’ by Barry Fitzgerald, July 27, 2005.